After conditioning in a glass carboy for four and a half months, it was finally time to bottle Sam’s Mead. 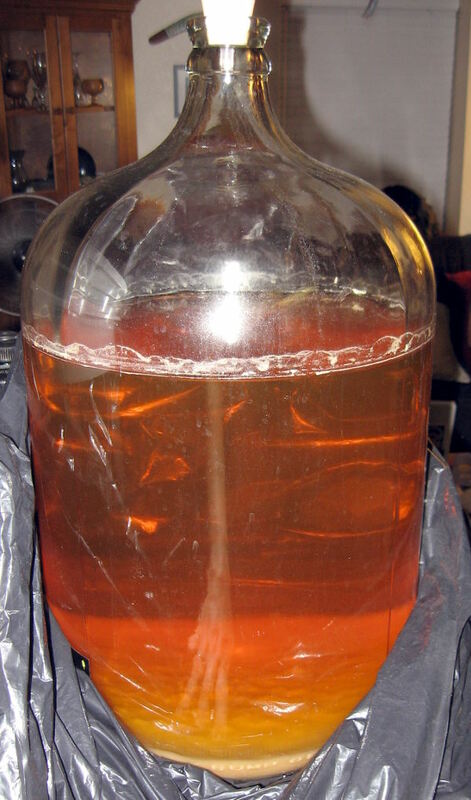 The mead had settled very nicely, and was wonderfully clear. It has a light straw color, and a surprisingly smooth taste for being so young. There’s just a slight “hot” note, that I’m presuming will mellow out over the next few months. We got 43 12-oz. bottles (and one half bottle) as well as one 22-oz. bottle. The final gravity was spot on at 1.000, down from 1.119. This works out to around 15.6% abv. Bottling was completed on April 11, 2013. We plan to open the first “official” bottle on Sam’s birthday in November, and set aside a few bottles for special occasions through the years. The other great thing about this mead was that both sets of grandparents helped/were around for either the brewing or bottling. A true family product! This entry was posted in mead, Uncategorized. Bookmark the permalink.